TRAILER FIGURE is an experimental film about boys growing up without fathers. It explores how early detachment from a father figure affects emotional growth and engagement with the world. Through a dynamic fusion of physical theatre and hip-hop dance, FIGURE follows two young men (Nnabiko Ejimofor, Lanre Malaolu) as they search for answers both outside and inside themselves. Produced by Lorna Nickson Brown. Click here to watch a recent interview with the creative team. Q&A with director Lanre Malaolu after the screening. 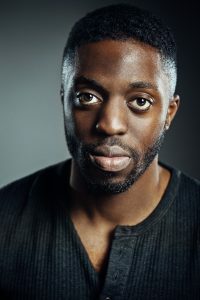 Lanre Malaolu is a choreographer and movement director based in London, UK. In 2016, he was chosen to be a choreographer on the inaugural OLD VIC 12; a talent group supported by the Old Vic Theatre comprised of the most exciting emerging artists in the UK. He was the choreographer and movement artist on The British Council film ‘DEAR MR. SHAKESPEARE’, which was selected for the SUNDANCE FILM FESTIVAL in 2017. As a choreographer, his work has been supported by Arts Council England, The Michael Grandage Company, The Old Vic, Sadler’s Wells and East London Dance. His work has also been performed internationally in Barcelona (MAC festival) and the USA (Breakin’ Convention 2017 tour). FIGURE is Lanre’s debut film.